Taken from a section of “Mercanti”, “The Galleon” focuses on the activities taking place along the docks of Venice as a large Galleon unloads its cargo. The merchants from aboard ship have already made their way ashore and have begun to make their deals. The painting was the work of Francesco Guardi (1712-1793). A prolific artist, he didn’t start painting his views of Venice until near the end of his life, though today they are perhaps his best-known works. Unappreciated in his time, Guardi died penniless. Ironically, he is known now as one of Venice’s most celebrated painters. His attention to event the smallest detail is absolutely superb, right down to the attire of the merchants and the waving pennants on the ships. 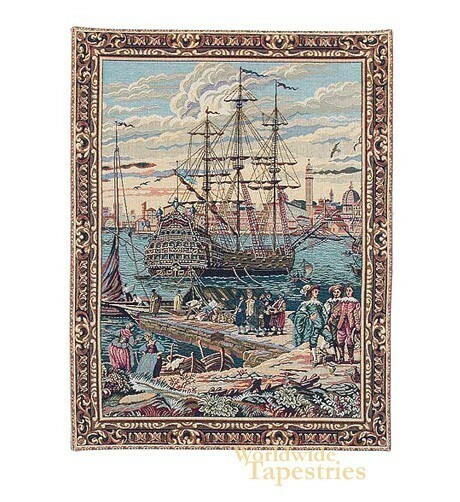 This tapestry celebrates his artistry. It is lined on the back and has a tunnel for easy hanging.